THESE CABINETS ALL COME FROM THE SAME SENIORS HOME. THEY WERE MADE BY PALLISER. THEY SELL AS A GROUP OR SEPARATELY. THEY WILL BE DESCRIBED FROM LEFT TO RIGHT AS SEEN IN THE PICTURES. THE LEFT ONE IS 31 INCHES WIDE, 20 INCHES DEEP AND 78 INCHES HIGH. THERE ARE THREE TOP SHELVES WITH TWO AJUSTABLE. THEN THERE IS A FULL WIDTH DRAWER. THEN THERE ARE TWO SHELVES. IN STORELIKE CONDITION. FROM A NON SMOKING HOME. THE CENTER CABINET IN THE PICTURES. IT IS 24 INCHES WIDE, 20 INCHES DEEP AND 78 INCHES HIGH. THERE ARE TWO TOP GLASS DOORS. THEY COVER THREE LIGHTED SHELVES. THE TOP TWO SHELVES ARE GLASS. 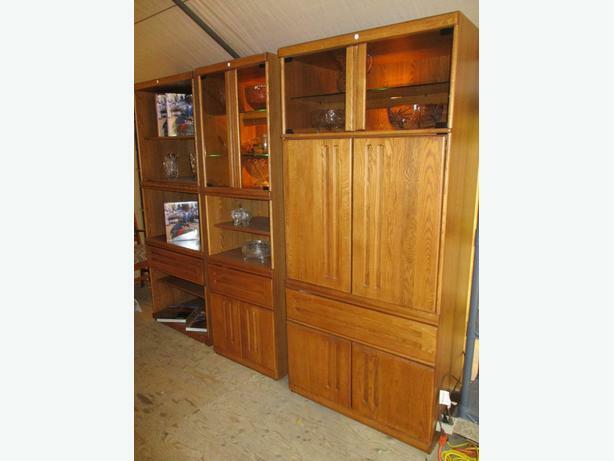 BELOW THE DRAWER ARE TWO WOODEN DOORS COVERING TWO SHELVES. THE TOP SHELF IS AJUSTABLE. IT IS IN STORELIKE CONDITION FROM A NON SMOKING HOME. THE FAR RIGHT CABINET IN THE PICTURES. THIS ONE IS 78 INCHES HIGH, 20 INCHES DEEP AND 35 INCHES WIDE. THE TOP HAS TWO GLASS DOORS COVERING TWO LIGHTED SHELVES. THE TOP SHELF IS GLASS. IN THE MIDDLE ARE TWO DOORS COVERING THE TV AND VIDEO/ DISC PLAYER COMPONENTS. THE TWO DOORS CAN BE CLOSED, OPENED FOREWARD OR OPENED AND SLID BACK INTO THE TV BOX. THE OPENING FOR THE TV IS 30 1/2 INCHES BY 24 1/2 INCHES HIGH. BELOW WHERE THE TV SITS THERE IS AN AREA FOR THE DISC / VIDEO PLAYER. BELOW THE TV SPACE IS A FULL WIDTH DRAWER. THEN THERE ARE TWO WOODEN DOORS COVERING TWO SHELVES. THIS UNIT IS IN STORELIKE CONDITION FROM A NON SMOKING HOME.